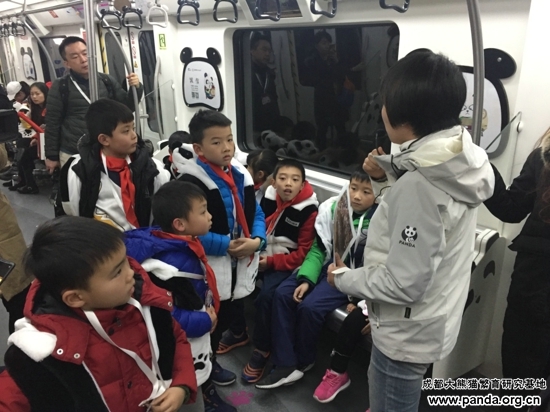 Recently, over 40 children and their parents or guardians were given the special honor as the first group of passengers to take the Phase-II and Phase-III extensions of Chengdu Metro Line 3. 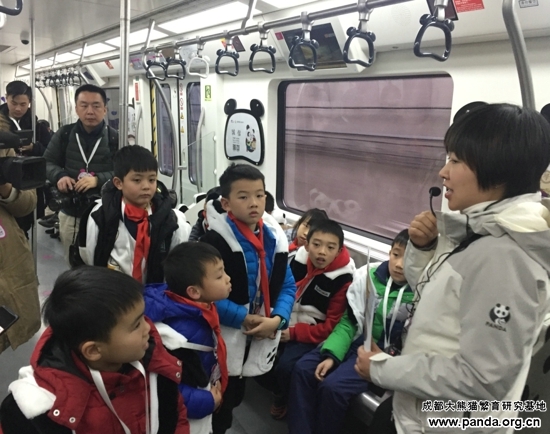 A science teacher from the Chengdu Research Base of Giant Panda Breeding delivered a public lecture titled The Metro and Pandas to the passengers on this special “panda” train. The science teacher introduced the Chengdu Research Base of Giant Panda Breeding’s general situation and geographic location, as well as how conveniently they can get their via public transportation. The teacher explained many interesting topics about pandas to the children, and meanwhile encouraged the children to be observant little scientists. They should carefully observe panda behavior and habits and personally find something they like about the pandas residing at the Base as well as visit the museum, discovery center, and other facilities. These facilities can aid them in systematically and deeply understanding even more about giant pandas, what the staff is doing for giant pandas and other wild animals, and what we can do every day to improve the homes of wild animals and protect our ecological environment.